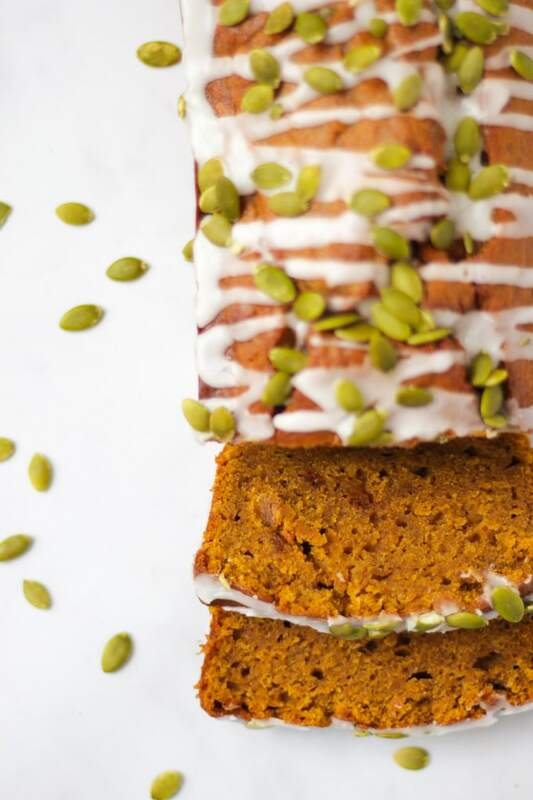 A delicious and easy Pumpkin Spice Loaf recipe. 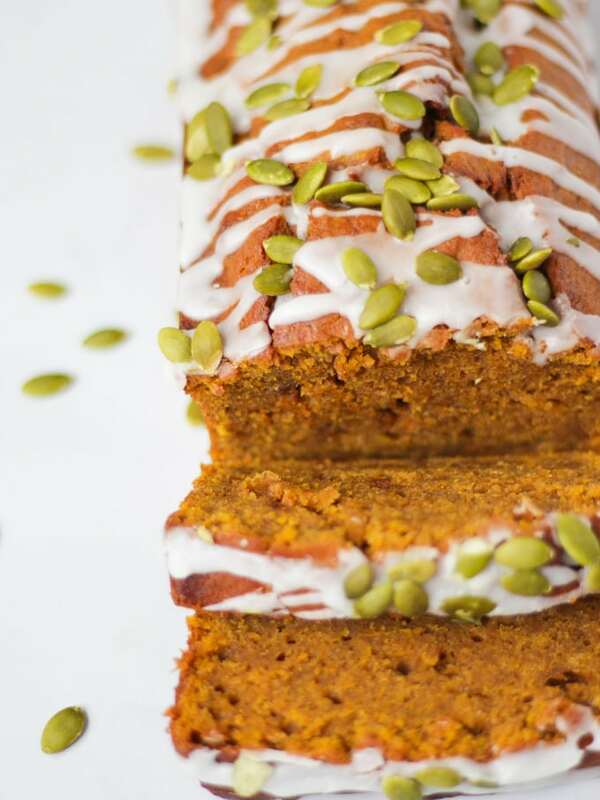 This moist pumpkin cake is perfect for Autumn or Halloween. It’s also easily made gluten free. This is one of my most favourite seasons, we are into the land of cosy jumpers, log fires and.. PUMPKIN! 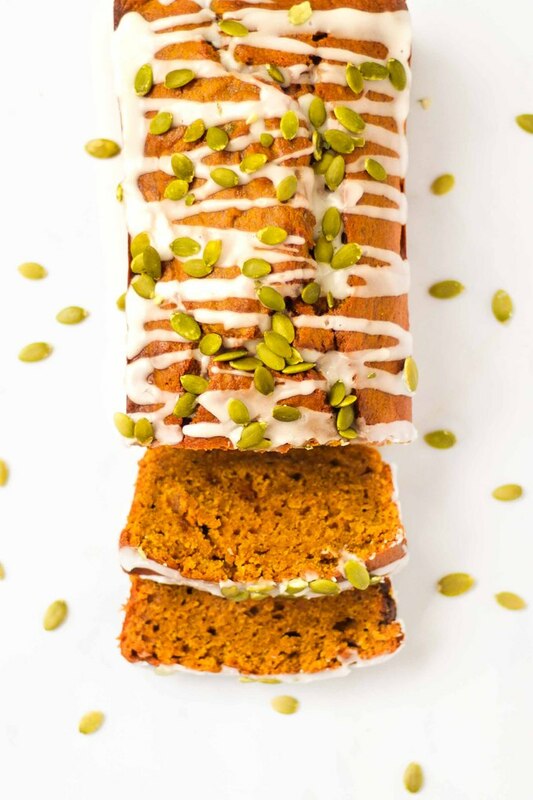 Have you ever tried the Starbucks Pumpkin Spice Loaf? Once a week, on the way home from school, George and Harriet and I stop at Starbucks for a Babycino (them) and a Flat White (me) and a treat. I’m not the biggest fan of Starbucks coffee, but it’s a chance for us to have a little date, the three of us and they love it so all’s good. Plus, I discovered this cake a few years ago. I loved it so much, I made a tiny version in these Mini Pumpkin Bread Loaves and later as a big layer cake with coffee icing in my Pumpkin Spice Latte Layer Cake (are you seeing a theme? This cake is goooood!). I realised this year, that I’ve never made a full size loaf.. so here it is. 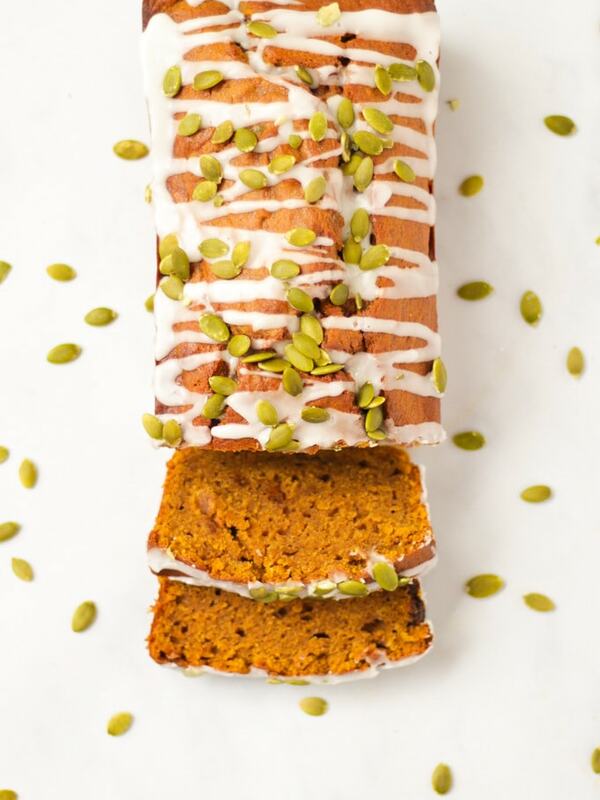 This pumpkin cake feels healthy enough to eat for breakfast with a cup of coffee and also naughty enough as an afternoon treat. It freezes really well and keeps for a few days in a tin. What’s not to love?! 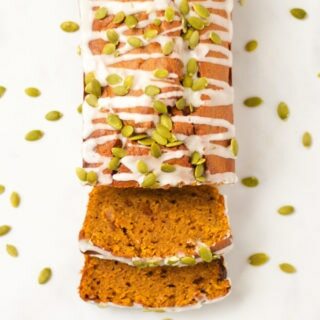 How do you make Pumpkin Spice Loaf? This Pumpkin Cake is a really simple cake batter, mixed up in just a few minutes with either an electric whisk or by hand. You simply mix all of the wet ingredients together, and then combine with the dry, easy! Pop it all into a greased and lined loaf tin, and bake until firm and cooked through. Whilst the cake is cooling make your lemon icing. Once the cake is cooled I then drizzle all over with lemon drizzle icing and sprinkle pumpkin seeds liberally on top. Do I need to use fresh pumpkin to make Pumpkin Cake? 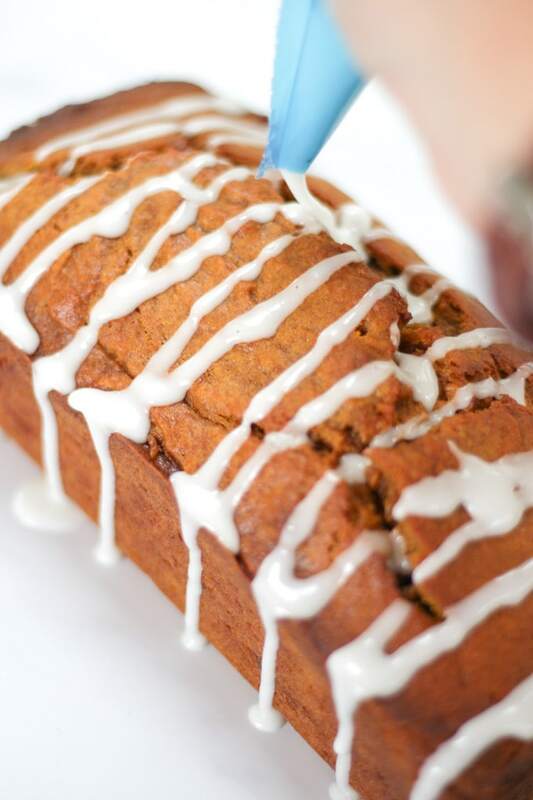 No, you don’t need to use fresh pumpkin to make this Pumpkin Spice Loaf. I must admit that I hate cutting up fresh pumpkins and scooping them out. I use pumpkin puree in tins, I’ve found it on Ocado online (and Waitrose stores) and I think other big supermarkets stock them too, especially at this time of year. However, with Halloween approaching, if your house is anything like mine there will be an abundance of pumpkins ready for carving, so this makes a great way of using up all of that left over flesh. To use up lots of pumpkin, scoop out the fresh, cook, puree and freeze some so you can have your little bit of Starbucks at home on future cozy autumnal afternoons. Use the zest of your lemons in the cake batter and save them to use the juice in the drizzle icing. This recipe can easily be made gluten free, buy substituting the plain flour for a gluten free equivalent. Fancy some other easy loaf cake recipes? How about my Orange Drizzle Cake or Nutella Cake? Hope you enjoy this recipe as much as we do. 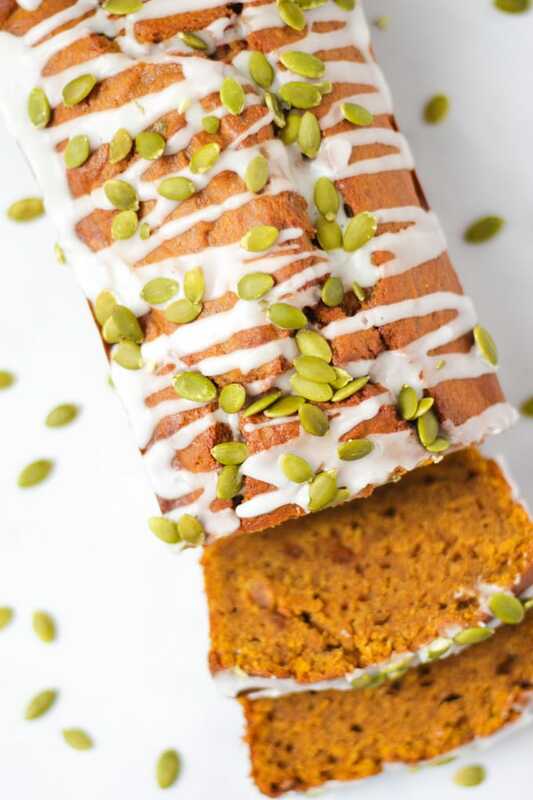 I’d love to know how you got on and what you thought of it if you make this Pumpkin Spice Loaf recipe. Please rate the recipe and leave me a comment below if you do. Preheat oven to 160c (fan oven, 180c conventional). Grease and line your 23x13 cm loaf tin with baking paper. 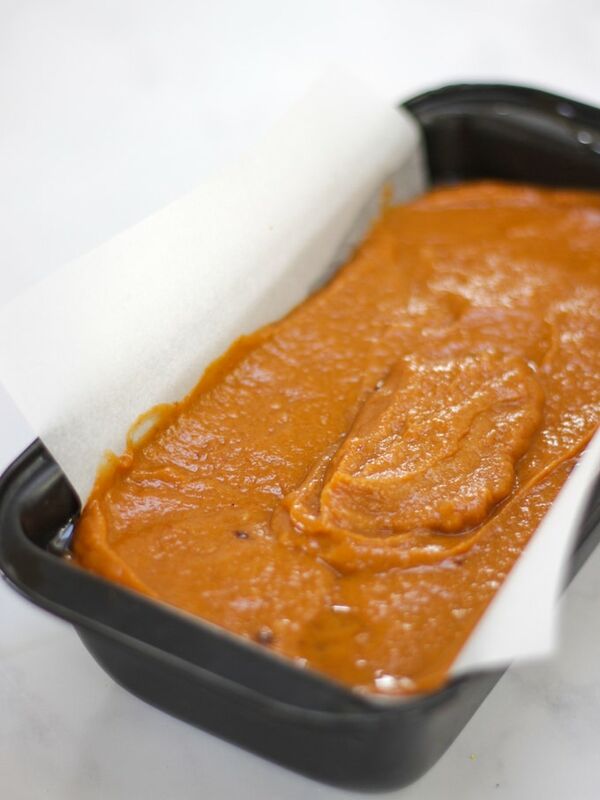 Pour into a lined and greased loaf tin and bake for 45 - 55 minutes until cooked through and a skewer comes out clean. Allow to cool for five minutes and remove from the tin. Meanwhile make the icing by mixing the sieved icing sugar and lemon juice together until smooth. Liberally drizzle the icing over the top of the cake and sprinkle on the pumpkin seeds. Made this with my daughter today! We really enjoyed making this cake. It was delicious! We’re totally in the autumn mood now! Thank you for sharing this recipe!